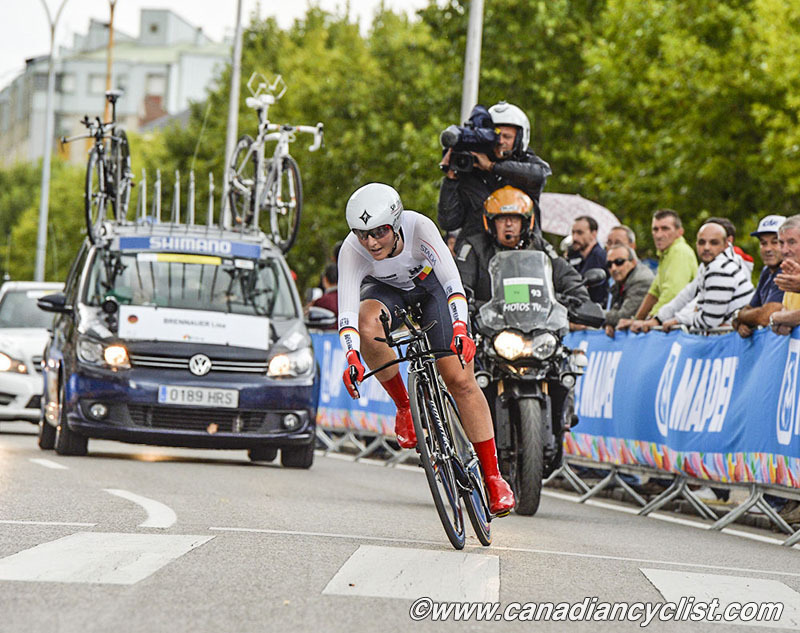 The second day of individual time trial competition on Tuesday at the Road World Championships in Ponferrada, Spain, saw German riders win both the Junior Men's and Elite Women's world titles. 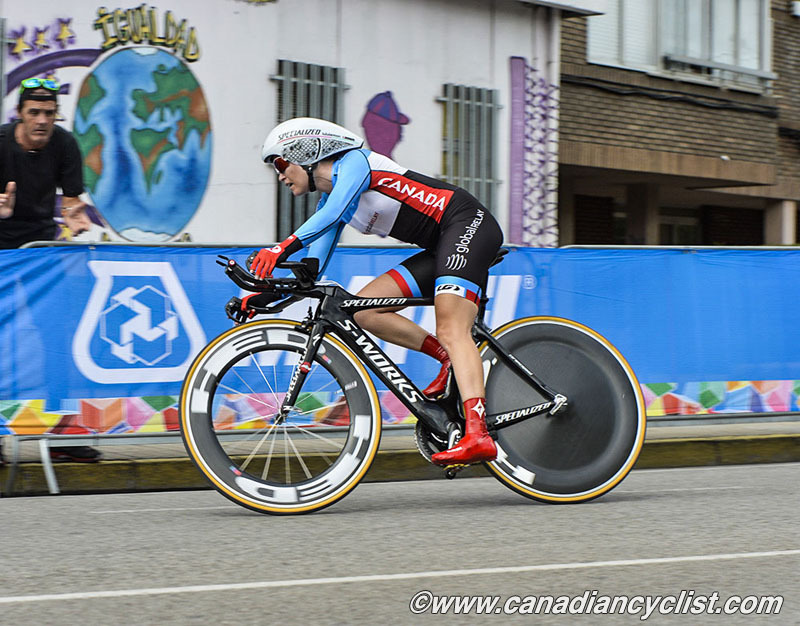 Canada's top performance was a strong sixth place by Karol-Ann Canuel in the Elite women, to go with her gold medal from Sunday in the Team Time Trial. Both fields rode the same 29.5 kilometre course, which featured many technical twists and turns, plus a final short, steep climb and narrow, fast descent into the final kilometre. Rain had been predicted, but held off all through the Junior men and only arrived for the final few riders of the Elite women, when a torrential downpour swept in. In the Junior men, Poland's Szymon Sajnok set the first sub-39 minute time, which held for 25 riders until Michael O'Loughlin (Ireland) broke 38 minutes. The time continued to creep down until American Adam Costa broke 37 minutes with a time of 36:58.15, and Costa held the top spot until Germany's Lennard Kamna, the final rider, completely demolished it by nearly 45 seconds to take the title. 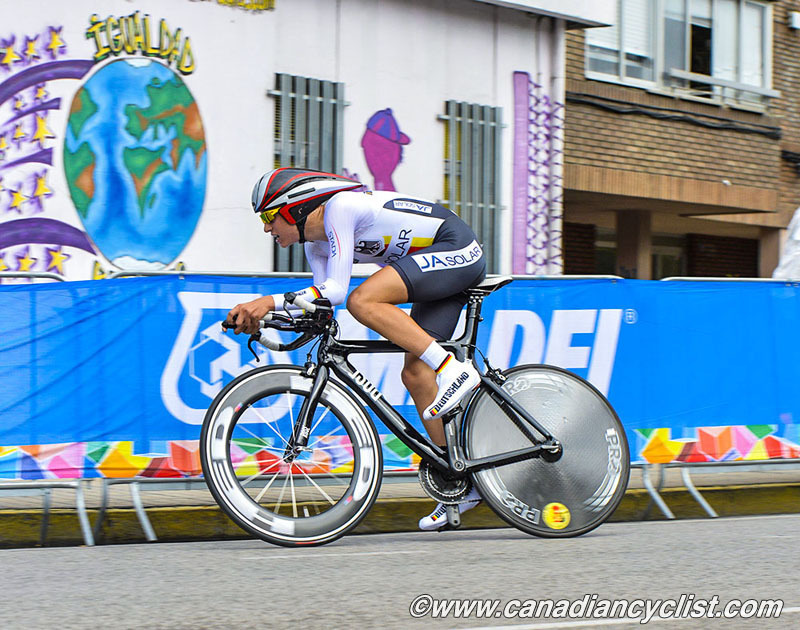 Canada had one rider entered, Pier-André Cote, who finished a disappointing 47th. "Today was definitely a hard day for me," said Cote. "I was expecting a lot from the TT and unfortunately the legs were not there with me, and I realized it a bit after the first time gap where I was still doing well." "The beginning of the TT was a descent and it was going well at the time, I was holding a respectable speed until I turned to get to the false flat which was really long. I managed to hold good watts for a bit, but I realized fast that [the power] was missing. The rest of the course was hard because after that there were no more easy parts were you could just get your pace back." "So if I can make a conclusion about my performance, I'm disappointed a lot, like I said earlier, because I was expecting a lot more. Even if I wanted to make this a performance I must take it more as an experience that will help me adapt for next year and work for a way better result. I'm still taking this as something positive that will help me get better in the future." In the women's race, which started with bright sun, American Alison Powers was the first rider to come close to the 40 minute barrier, with 30 riders to go. She held the lead through nine riders until Germany's Mieke Kroeger knocked 36 seconds off, which would be good enough for fourth. 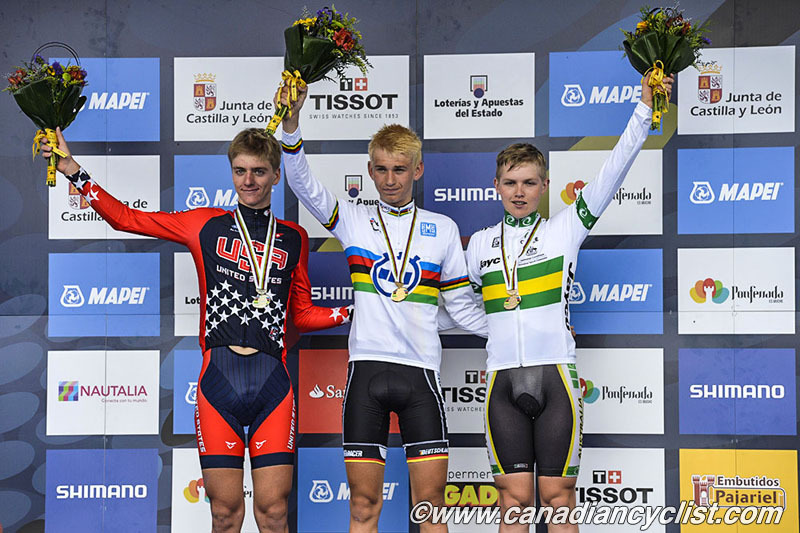 Canada's Canuel slotted in 13 seconds behind with 17 riders to go, and was still sitting in third with five riders to finish. 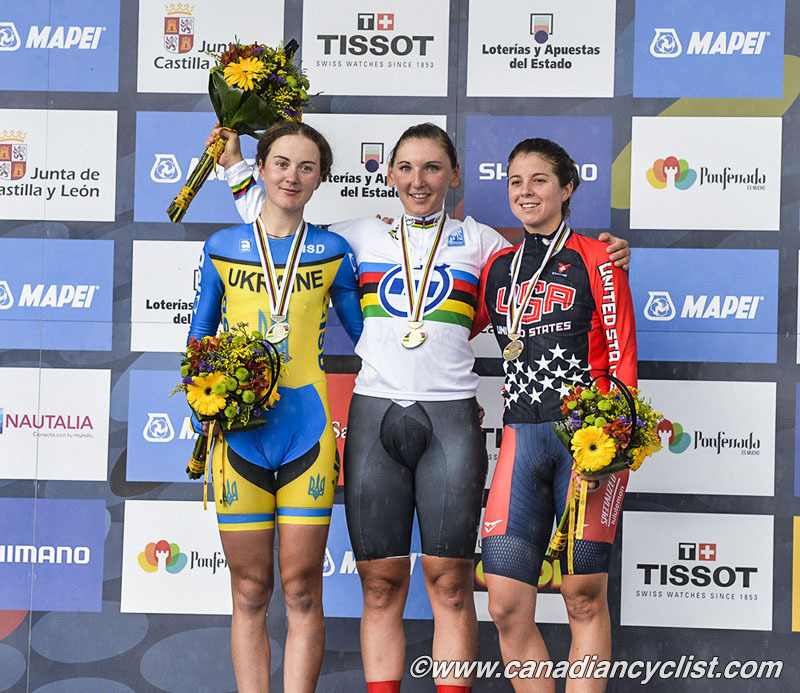 Leah Kirchmann, the Canadian time trial champion, struggled and finished a distant 27th. However, Anna Solovey (Ukraine), at five to go, took 20 seconds off the best time to jump into the lead. American Evelyn Stevens finished 2.67 seconds back, and then favoured Lisa Brennauer of Germany came in nearly 19 seconds faster to take the lead. Linda Villumsen (New Zealnd), second from last to start, was well off the pace and the final starter defending champion, Ellen van Dijk (Netherlands), after a strong intermediate split, began to fade, and was then hit with heavy rain in the final kilometres, eventually finishing seventh. "I'm super happy with my result," commented Canuel. 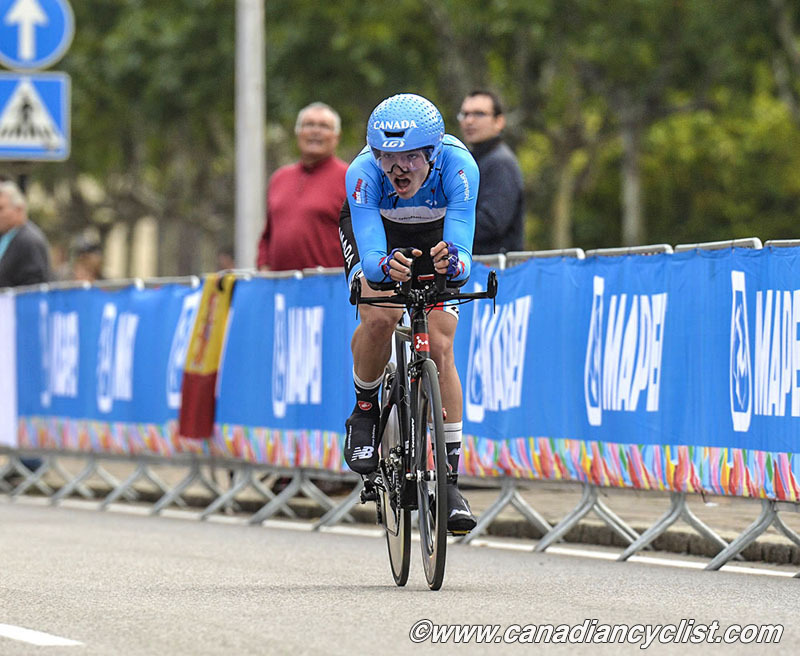 "I wasn't sure what to expect, as I hadn't done an ITT at this level, but I've been working hard the past few weeks with my team, Specialized-lululemon, and I knew I could do well today." "It's exciting to know that I feel like I can improve. It's even more special because I had a bad crash in June which took several weeks to recover from. I'm really looking forward to the road race on Saturday." Earlier this season, Canuel suffered multiple injuries in a crash at the Liberty Classic race in Philadelphia, notably a broken vertebrae, a fractured rib and a concussion. After more than six weeks off the saddle, Canuel resumed training in mid-July.